From being rather odd-shaped in the 80s to being mostly regular shaped these days, the balcony has evolved from a smoking corner to being more functional and useful. If your house comes with a balcony, or even two, have you thought of how you can get the most out of it? Gone are the days when people just left their balconies un-done and simply used it for storage. Nope, with today’s property prices in Singapore, we are going to need every inch of space, including, if not especially, the balcony. Hopefully, this article can help you shed some light on getting your ideal balcony. To me, the functional aspect trumps every other consideration. Once you’ve decided on the functions, you can dress it up more easily. Will you be drying your clothes there? Realistically, we don’t want to. But sometimes, there’s just no choice! Some clothes can’t be put in the dryer, and the sun hits the balcony beautifully. If that’s the case, don’t apologize. Simply plan for it. Tip: Decide if you want to dry clothes on your balcony early, and conceal clothes lines boxes with custom-built screens. Will your children be spending much time there? It’s a great place to get their daily dose of vitamin D without the full blown sun. If they’re going to be spending time there, you’ll want to make sure that the flooring is comfortable and easy to clean. 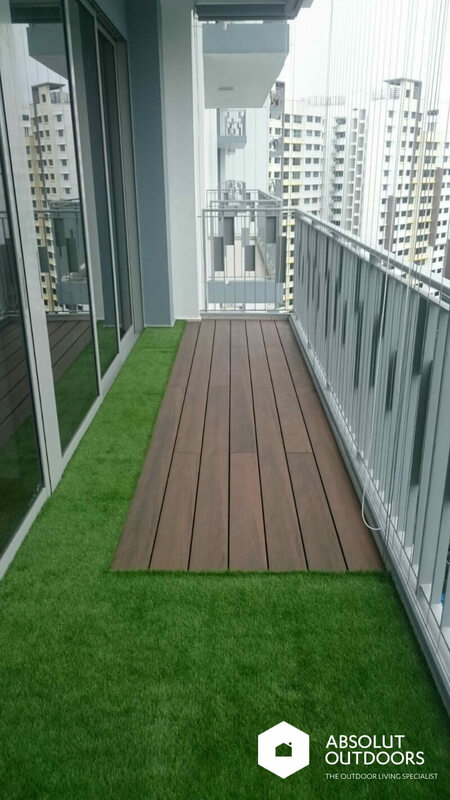 You can consider using either artificial turf or decking (or both, why not?!) 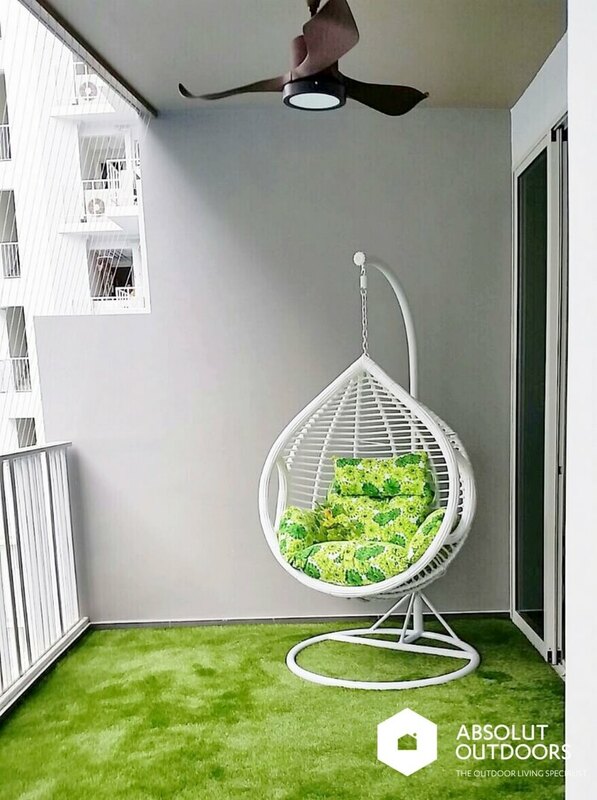 to create a soothing environment on the balcony. 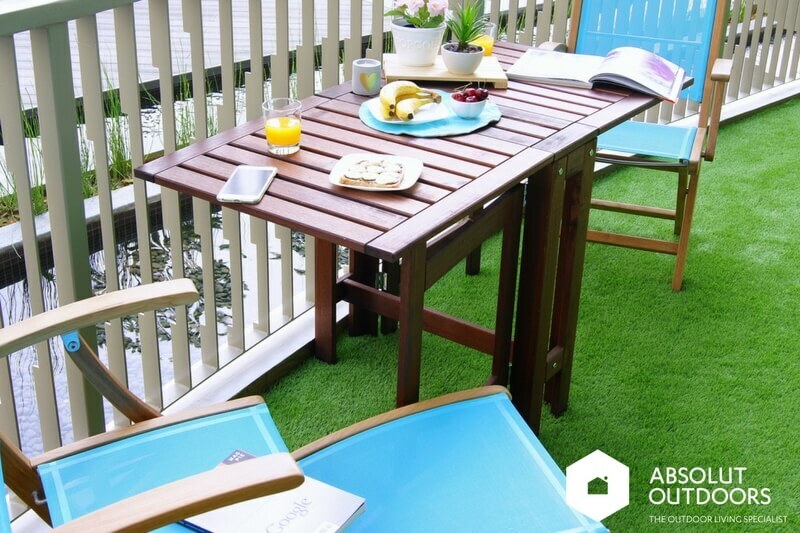 Artificial grass and our Absolut Wood decking are both easy to maintain and durable. Tip: Choose artificial grass or decking that is easy to maintain and durable. Planning to do some planting? Some balconies of condominiums or ECs (executive condominiums) come with planter boxes where you plant in a recession in the balcony. The benefit of this is that you won’t have many pots of plants lying around. The disadvantage would be that the planter box space is reserved for the plants alone. If you choose to cover the planter box, you can still plant in pots and still make use of that area for play or dining. 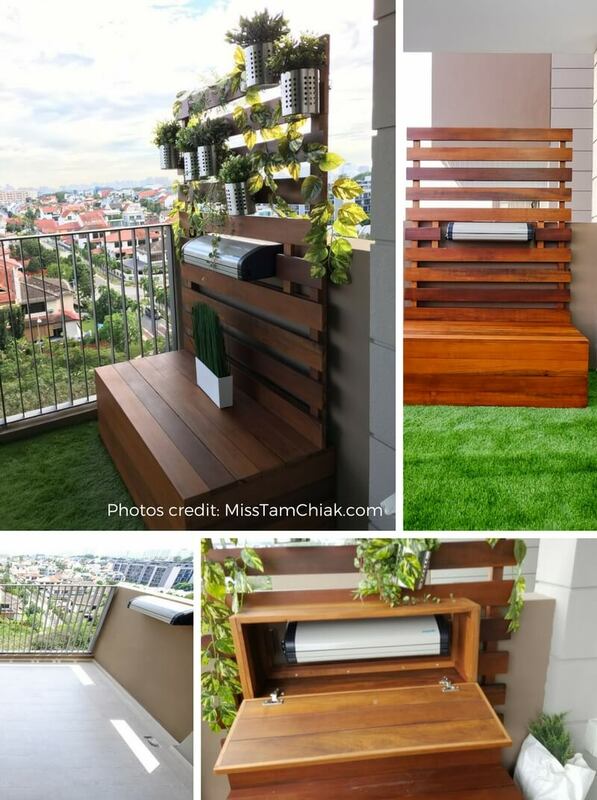 Tip: Cover planter box for more flexibility in using your balcony space. Do you plant to eat out at your balcony much? If so, go for flexible dining table options so that you can expand the table where necessary or keep it cozy for two when there are no guests. 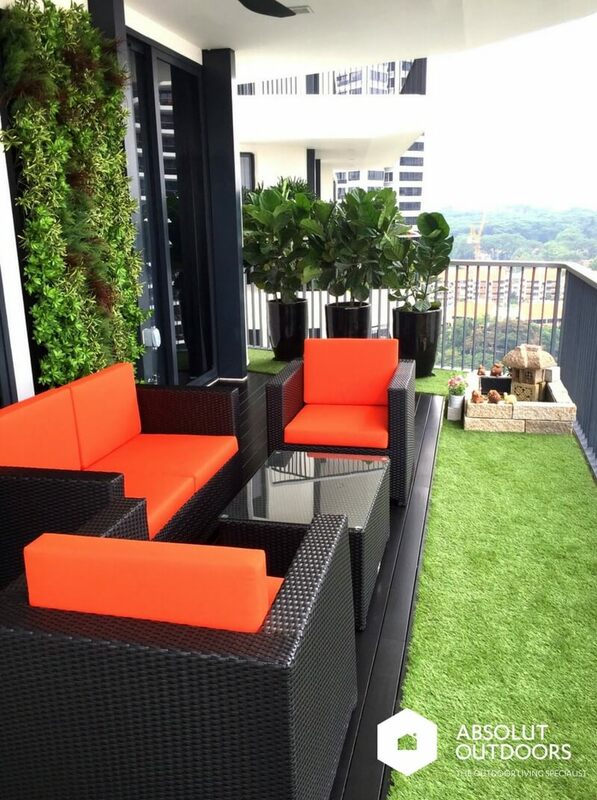 But if your balcony is big, go all out and deck it with outdoor furniture like sofa sets and water features. 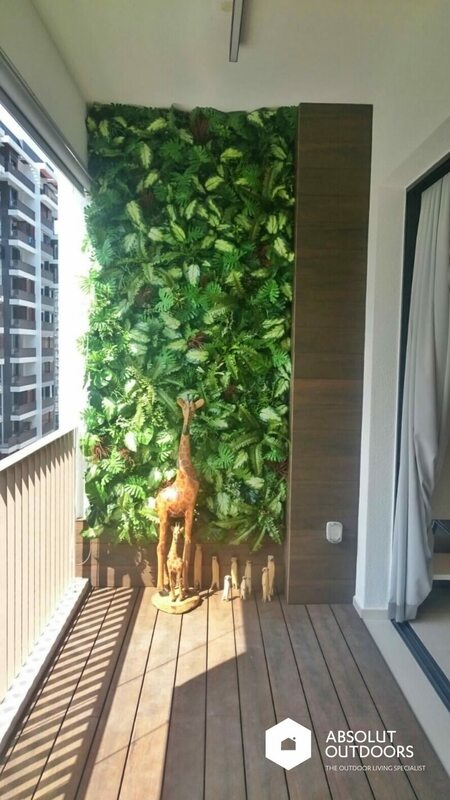 You can also consider an artificial green wall for privacy from your neighbours. Artificial vertical gardens, as some call them, are also very good at absorbing noise so you won’t end up disturbing your neighbours when you have friends over. 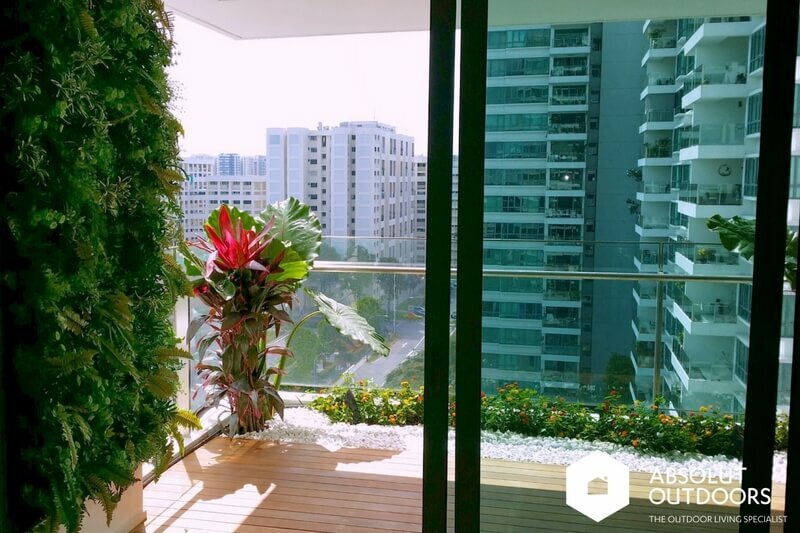 Or maybe it’s the other way round, your neighbours won’t disturb you that much with the artificial green wall as a shield and sound absorber. Tip: Go for flexible outdoor furniture to cater to more or fewer people where necessary. Reading on the balcony is so therapeutic. On days when you don’t have to go to work, it’s such a joy to just sit out there, enjoy your favourite drink and just read. You may want to have a standing lamp or position your lights in a way conducive for your reading. So when you’re talking to your electrician, it’d be best to have an idea first. Tip: Plan lighting and electrical points to make sure you have good light when you read at your balcony. These days, taking good photos are not just reserved for bloggers. But unless you’re a professional photographer who knows how to work any lighting condition, you’d be better off taking photos in natural light. And what better place to get natural light than your balcony? 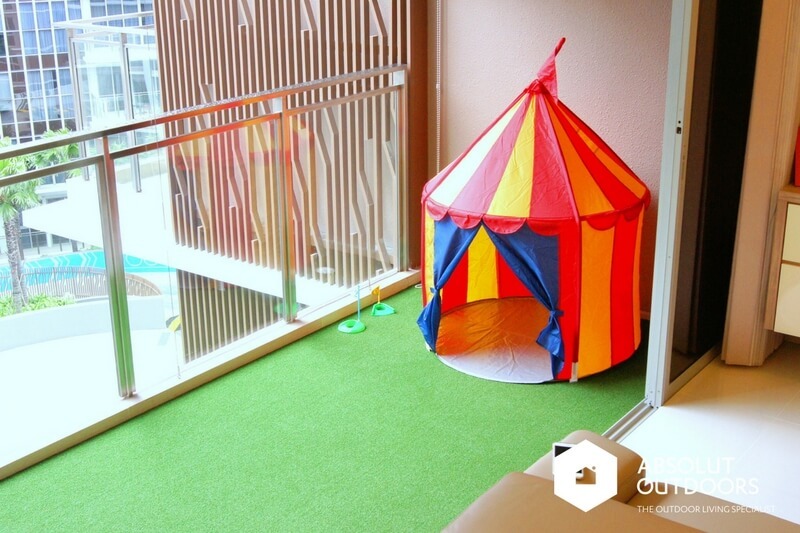 It’s sheltered and is the perfect place to take food shots and outfit-of-the-day (OOTD) shots. If you are always wondering how your friend always takes better pictures than you on Instagram, the answer may well be natural light. 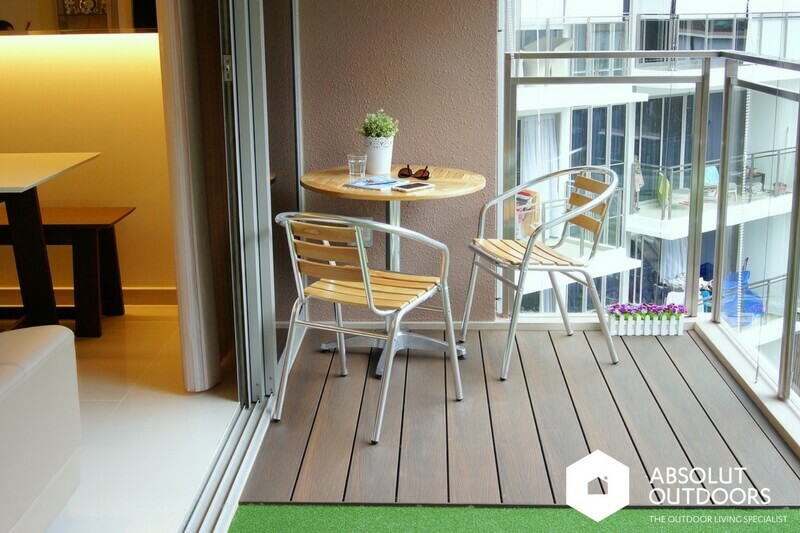 If that’s the case, get your balcony Instagram-worthy with a few simple additions like artificial grass flooring on one side, and decking on the other. This way, you’ll have two options. 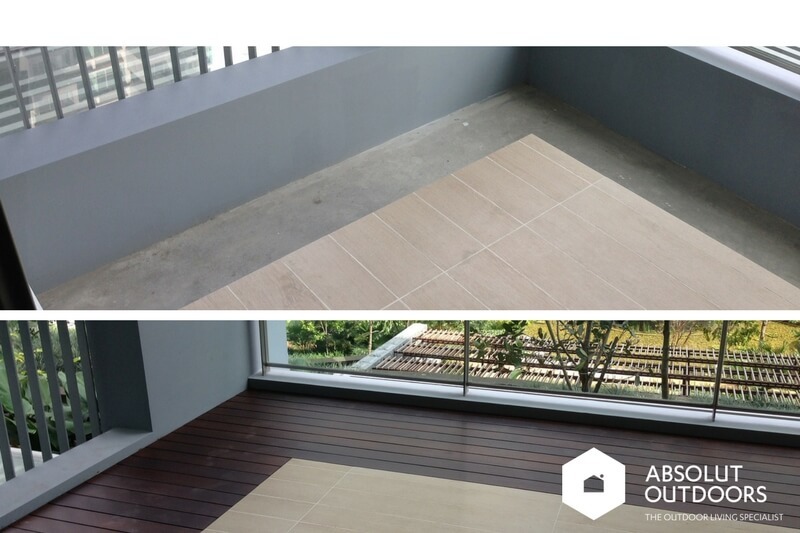 The only constraint is if your balcony is too small and using two different flooring don’t make sense. And most definitely consider having an artificial green wall or drape plants on your light to get that natural wood-land feel. Tip: Choose two different flooring for more photography options. Install an artificial green wall for a soothing and beautiful backdrop. Hopefully, with these six tips, you’ll be able to design a balcony that you and your family love and will spend many happy hours at. If you’re looking for a reliable company to install your outdoor flooring and artificial green walls, please feel free to contact us. We are running some exclusive deals for residents of up-coming condominiums and ECs like Bellewaters, Bellewoods and Signature. Contact us at enquiry@absolutoutdoors.com or call Emily at 8717 1581 today!